Launched: 2010. Our tagline “Taste of the Islands” was the inspiration for Ocean Blue. Our goal was to come up with a flavor that transported anyone who tasted Ocean Blue to an Island and ocean setting. Blue, fit perfectly with the ocean theme. And the combination of three different blue colored berries (blueberries, blackberries and blue raspberries) plus lemon, creates a unique flavor with a strikingly Blue Ocean feel. 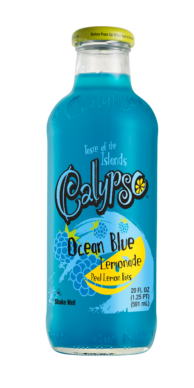 Because of that, Ocean Blue is one of Calypso’s most popular flavors.